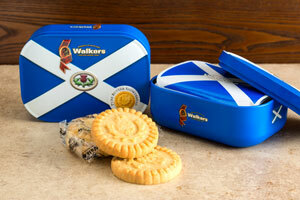 This rounded edge tin is filled with eight thistle embossed shortbread cookies. 4.6 oz. You'll definitely want this tartan Nessie tin for your collection. 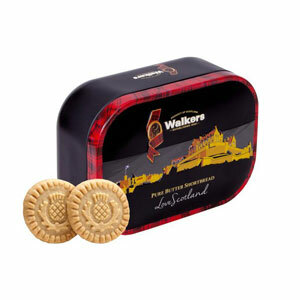 Filled with shortbread rounds embossed with thistles from Walkers of Aberlour, you'll love the cookies today, but enjoy the tin forever. Tin measures 5" by 3.5" standing 2 inches tall. 4.6 oz of shortbread inside, packed two cookies per package, eight pieces of shortbread total. 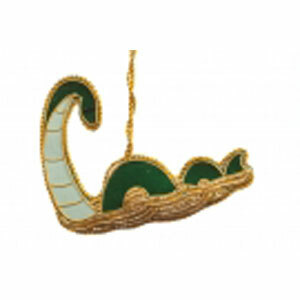 A great stocking stuffer, small gift or teacher present. Ingredients: Wheat flour, butter(32%), sugar and salt. The Walkers story begins over a hundred years ago in 1898, when the twenty-one year old Joseph Walker opened the doors of his own bakery with a loan of 7 pounds and 50 pence and the dream of making the finest shortbread in the world. By 1975, Walkers had outgrown their extended bakery, and moved to a custom built factory that gave them the extra space and facilities they needed to develop new products such as Chocolate Chip Shortbread and specialty biscuits. Still family owned and operated, today the fourth generation of the Walker family uses the same traditional recipe developed over 100 years ago, and is the largest shortbread company in the world.